In this paper, highly porous carbon as an electrode material was derived from litchi pericarp (denoted as L-PC) via carbonization combined with KOH activation process. L-PC displayed high specific surface area (3438 m2 g−1) and high pore volume (1.92 cm3 g−1). 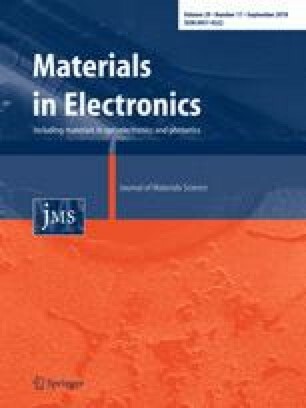 The electrochemical capacitive properties of L-PC using KOH aqueous electrolyte were studied in three and two-electrode cells. The specific capacitance was 407 F g−1 in the three-electrode system at 1 A g−1, which was much higher than that of other biomass-derived porous carbon. In the two-electrode cell, the symmetric supercapacitors could work in a voltage window of 1.0 V. The highest specific capacitance of 70 F g−1 and energy density of 9.7 Wh kg−1 were exhibited in the two-electrode cells. About 98% of the initial capacitance was retained after 6000 cycles at 2.0 A g−1 in the cell. The highly porous carbon derived from litchi pericarp might act as an ideal electrode material for high performance supercapacitors. The online version of this article ( https://doi.org/10.1007/s10854-018-9636-5) contains supplementary material, which is available to authorized users. This work was supported by the National Natural Science Foundations of China (Grant Nos. 21663026, 51462031, 11564034, 11764036), the National Natural Science Foundation of Gansu Province (Grant Nos. 1606RJZA064, 17JR5RA283) and Project of Science and Technology of Gansu Province (Grant No. 17YF1GA025). This work was also supported by the Central Universities Basic Service Fee (Grant Nos. 31920150010, 31920150243, 31920150244 and 31920170008).